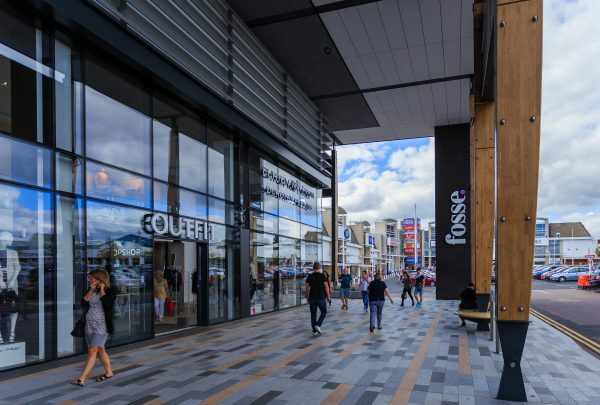 The first phase of a major facelift at one of the UK’s largest premium retail parks, Fosse Park in Leicester, has completed this summer. This multi–million pound phased redevelopment will ensure the popular shopping destination continues to meet the evolving needs of 21st century shoppers and secure its position as the region’s leading lifestyle and fashion destination. The site is home to the recently completed phase one development, which includes a new Primark flagship store, and new stores from Office and Pandora. The upgrade was designed by The Harris Partnership and includes the installation of modern facades and raised canopies that enhance store exteriors and significantly improve retail visibility. The first phase also saw the division of the former GAP store into two units. There have also been substantial upgrades to the landscaping of the park’s public spaces and redesign of the pedestrian walkways between store areas and the car parking facilities. At 560,000 square feet, Fosse Park is one of the largest and most sought after retail properties in the UK due to its location close to the M1 motorway and the fact it attracts around 10 million shoppers each year.